I finally found the time and words to sit down and catch up on my review writing yesterday. For a few of the books, it's been over a month since I read them, and so I cannot promise thorough reviews. Hopefully I was able to catch the spirit of the novels at least. In the meantime, I am trying not to feel too excited about the upcoming movie Divergent coming out, but it isn't easy. I am looking forward to seeing it after all. I finished reading the trilogy last week. My husband and I went to see the Veronica Mars movie over the weekend. We are big fans of the television show, having watched it when it first aired. The movie brought back a lot of memories, and it was good to catch up with so many favorite--and not so favorite--characters. For those not familiar with the story, Veronica Mars was a high school private investigator who now is on the verge of getting her law degree some 10 years later. In the movie, she returns home to help her ex-boyfriend out of a jam (he's accused of murdering his girlfriend). A couple months ago I came across mention of Sherlock Holmes and Watson earrings being sold on an Etsy site. I couldn't help but track them down. As I browsed the Bookity shop, I noticed a set featuring two of Agatha Christie's popular detectives, Miss Marple and M. Hercule Poirot. I just had to have them! It took them a while to arrive on my doorstep, arriving just last week, given they came all the way from England. Still, it was worth it. The earrings are homemade, which, to me, makes them extra special. What are you reading at the moment? Is it something you would recommend? The news of Anders Eckman's death came by way of Aerogram, a piece of bright blue airmail paper that served as both the stationery and, when folded over and sealed along the edges, the envelope. Who even knew they still made such things? This single sheet had traveled from Brazil to Minnesota to mark the passing of a man, a breath of tissue so insubstantial that only the stamp seemed to anchor it to the world. Mr. Fox had the letter in his hand when he came to the lab to tell Marina the news. When she saw him there at the door she smiled at him and in the light of that smile he faltered. © 2014, Wendy Runyon of Musings of a Bookish Kitty. All Rights Reserved. If you're reading this on a site other than Musings of a Bookish Kitty or Wendy's feed, be aware that this post has been stolen and is used without permission. Laurel-Rain - I am really enjoying it so far! BTW, I love the earrings!! Aren't the earrings great? It's tempting to go back and buy the Elizabeth and Darcy ones . . . I listened to this book and enjoyed it. Love the earrings. Love the earrings! 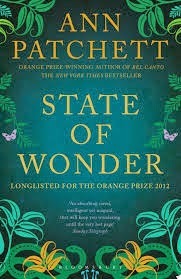 I'm a Patchett fan, so yes, I'd read this one. My "bookmark" is The Boy Who Stole from the Dead--and I'm surprised at how much I'm liking it! Jenclair - The title of your current read is enough to catch my attention. I am glad you are liking it so far. I absolutely loved this book - and the intro makes you want to find out why Anders' death matters. Sarah - I'm enjoying the book quite a bit so far! I love the earrings - what a cool idea. I'm listening to The Disappeared by Kim Echlin and so far so good. Oh my goodness, how wonderful is the Bookity Shop site,thank you for the link. Tracy - You're welcome! I spend way too much time on Etsy! I'm soooo behind on reviews right now it's not even funny! I did contain reading past that point in State of Wonder. Oh yes, I loved State of Wonder... hope you do, too! JoAnn - I am really liking it so far. I hate having to put it down to do those pesky obligatory activities. Kelley - I thought so too! That's a dynamic beginning. One of these days I'm going to read Ann Patcheet. Margot - It's my first by the author, and I am really enjoying it. I like this teaser. I would continue reading. Yvonne - It's an interesting book. I haven't read too many books set in Brazil, much less the Amazon. Diane - I'm enjoying it so far! When it comes to Ann Patchett, continuing to read is a no brainer. Patchett's one of my favorites. So many people love Ann Patchett's writing. I feel bad that it's taken me this long to give her a try! I love Ann Patchett. Hope you enjoy this book. I would, simply because I know it's one of those 'must-read' books. I like the earrings, and I agree, handmade are great. You know you're getting one of a kind, too, even if there are similar ones made. Glad to hear Veronica Mars is good. I didn't watch the show but the creation of the film has really interested me. Charlie - The whole kickstarter phenomenon is interesting to say the least. My husband contributed to the one that got the Veronica Mars movie made, so we have a bit of an investment in it. However small. I read this and really enjoyed it. Hope you do too. Paulita - I did! I finished it today with tears in my eyes. Loved the ending but hated that it left so many questions. It was more a case of me not wanting it to end rather than a bad ending though. Melinda - I hope you do get a chance to read the book. It was a good one. I have seen lots of hype over the Divergent film! Enjoy State of Wonder, I've heard it is a good one. Naida - I got to see the Divergent film this past weekend. It did not disappoint! Such cute earrings! I watched a season or two of Veronica Mars and liked her so I'm glad the movie delivers. Stacy - I am enjoying the earrings. They are a little heavy, but not too bad. Those earrings are great! I really must browse Etsy more! Oh great, now I am convinced I need Jane Austen earrings! Keep reading State of Wonder; it's so interesting.